Two days ago J and I went to the movies. I bought the tickets while J paid the check at the restaurant down the street. I told the young man behind the counter that I wanted two tickets, and he told me it was bargain Tuesday, and it was only $12.00. Nice surprise, until the guy in line for popcorn leaned over to ask the guy why he paid $16, and I only paid $12. The boy looked at me, shrugged his shoulders, and said “Seniors?” Wait, what??? I was crushed. I thought maybe at this theatre the “senior” discount came at age 50, which would be fine, since I’m 51. But I looked it up. It’s 62. I was really bummed. I thought perhaps he was just trying to be nice and giving me a discount. But probably, he thinks all people over 50 look the same. Or maybe it was just a bad, bad skin day for me. What does he know, he was 12. (But the fact that I called him a “young man” above kind of makes me sound like I’m 62. 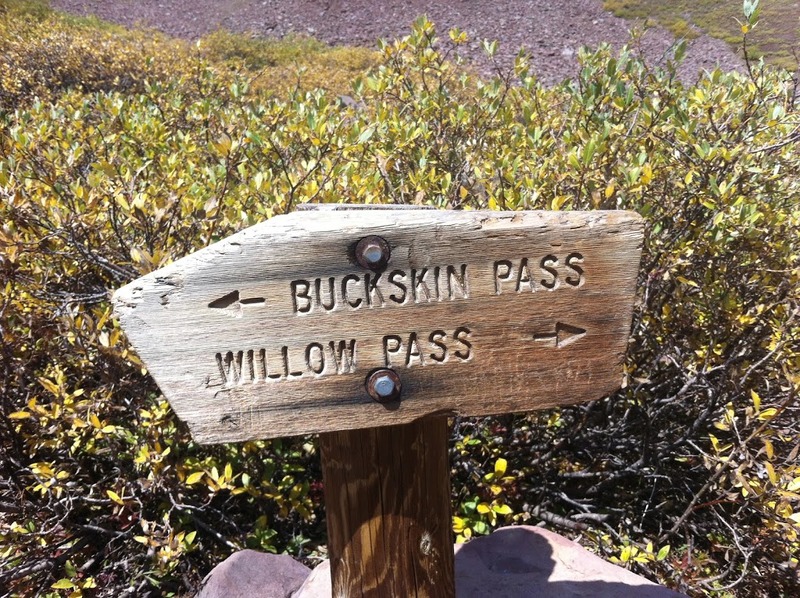 So, yesterday, J and I set out on our third attempt to make it to Buckskin Pass. 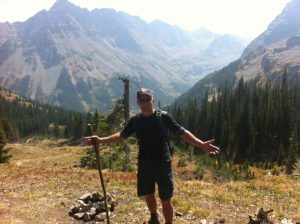 However old I look, I wanted to prove that I could do this hike! 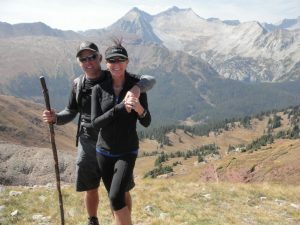 We’ve done a lot of beautiful, not so easy hikes, like Lost Man Loop (13,000 feet, 9 miles total), Government Trail from Snowmass to Aspen (11 miles), both American Lake and Cathedral Lake (both only 6 miles total, but lots of elevation), etc. 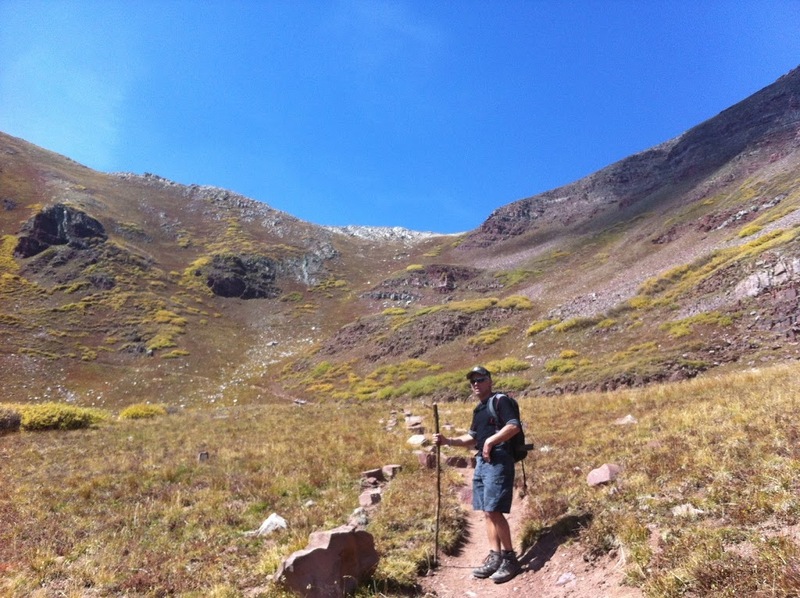 But this hike has been our nemesis this year! 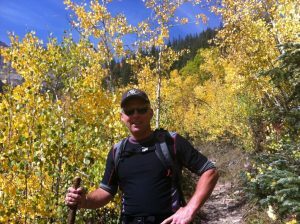 The first time we tried was our first day in Colorado, and we made it more than halfway. We were with our friends, and it was their first day, too, and we were all sucking wind pretty bad. 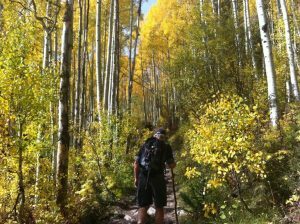 This is a beautiful hike, only 4.8 miles each way, but an elevation gain of almost 3,000 feet. So we made it about 3 1/2 miles, to a beautiful overlook, took photos, and came home. Last week we tried again, with another couple who were here visiting us. They weren’t acclimated yet, so even though they are both strong and fit, we didn’t make it. So, I was determined to see the pass. 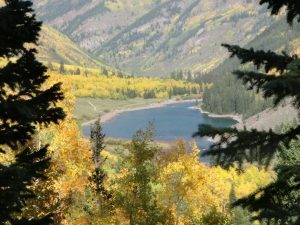 Starting at gorgeous Maroon Lake, overlooking the majestic Maroon Bells, with the golden aspen trees looking like they were lit from within, we easily hiked up to Crater Lake, the 2 mile mark. Crater Lake is almost not a lake right now…the drought has really caused it to dry up. Very sad. We stopped for water and started the steep climb past Crater lake. Every now and then we’d come to a clearing and marvel at the view (and catch our breath!). Coming from the East, I am used to the multicolors of the fall foilage, but here, the trees turn mostly yellow. I wasn’t expecting to be so blown away. 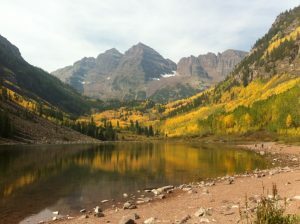 When the sun hits the golden aspen leaves, twirling in the wind, they look like sparkling jewels! The patchwork of yellow and green of the brush on the sides of the mountains is beautiful as well. We are so lucky to be able to enjoy such a show now, in September, and then go back home to see the October foilage in Tennessee and North Carolina. The climb went well, as we plugged along, taking small steps to conserve energy for the climb. When we got to mile 4, there was a sign directing us to the Pass, and looking up we could see our goal, as well as the STEEP switchbacks we still had to travel. 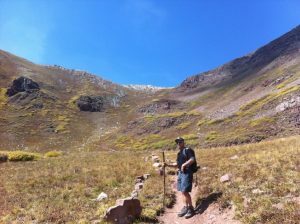 But we saw a couple of people ahead of us on the trail, so our competitiveness kicked in, and we made it to the top. 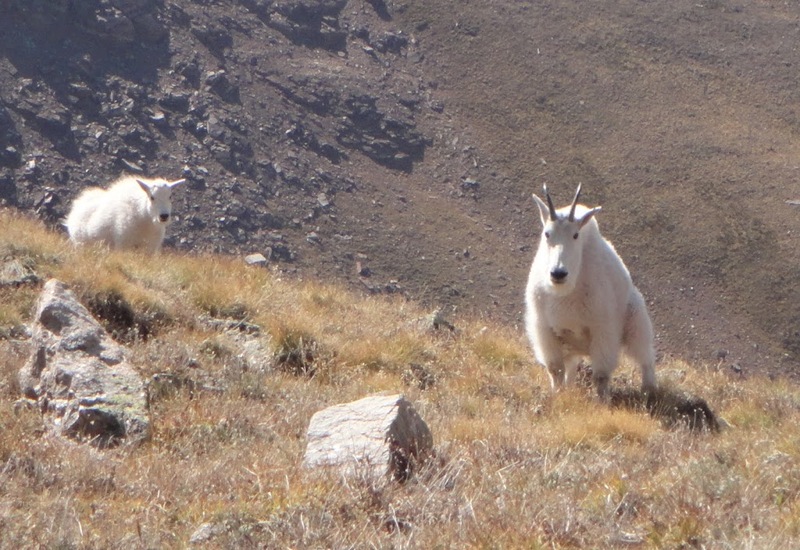 I have been so amazed by the wildlife we have seen here. H says we’re “obsessed” with it…but seeing huge Mule Deer walk through our backyard on a daily basis, a little orphaned cub eating grass outside my window, a porcupine, plump little fox (unlike the skinny ones we see in Nashville), Elk on our way to dinner, a mama Bear and her three cubs in a tree outside our restaurant at dinner…it has truly been amazing. 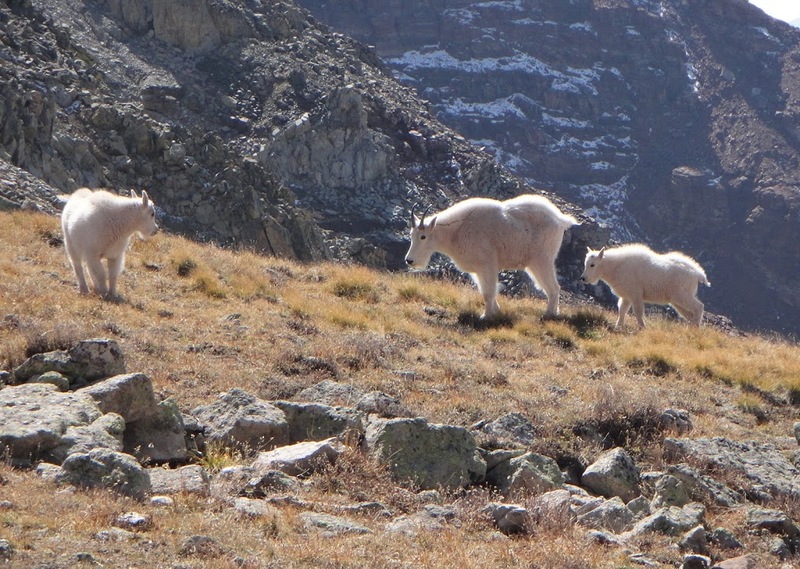 But I didn’t expect to see three snow white Mountain Goats up on the pass! It was a mama and two babies, and they were absolutely stunning. 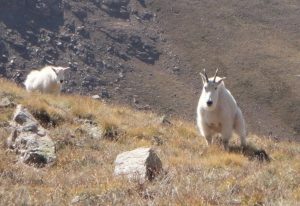 We sat on a rock at the top, looking at the Bells on one side, and Snowmass Mountain and Lake on the other side, watching the goats get closer and closer to us! 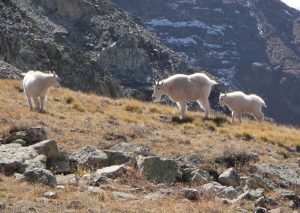 They weren’t brave enough to come grab our lunch, like the goat in the cell phone commercial, but close enough to get a couple of photos. All in all, it was a great day. 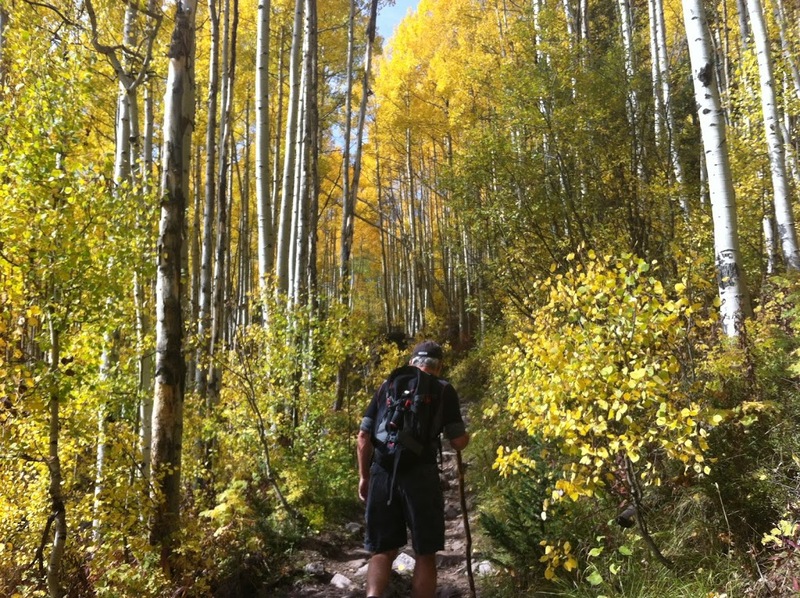 And it was a warm up for another big hike on Saturday. I’m not going to say what it is, because I don’t want to jinx it…but I’ll keep you posted! P.S. STAYED TUNED…My life has changed, with H leaving for college, so my blog will be changing in the very near future!